Rockstar Energy Racing traveled internationally to Toronto, Ontario Canada and revisited the success the team has been able to celebrate all year. Once again Davi Millsaps and Blake Wharton graced the podium as a duo in their respective classes. Certainly a positive night for both and a step in the right direction. There is still room for improvement and this 2 week break will give the riders time to work on what they need to land on the top step of the box. It was really impressive to see the team atmosphere when returning to the truck. Millsaps was upstairs coaching Wharton with some very valuable advice. The pair plan to spend time together during the off week at the test track and come out swinging when the series returns. It was a great thing to witness as Davi stated to Blake "You're part of the team. I want you to win for you and for the team, and I will do anything I can to help you." It's no secret that Davi has been a bit off the past few weeks. It's also known that he sustained a knee injury while practicing before Daytona and has not been able ride nearly as much as he would like. The tides are changing now however. Millsaps rode to a successful 3rd place finish in his heat race. Impressive was not the 3rd place finish but the lap times he was putting down. He was the fastest rider on the track. In the main event, he returned to the form he had early in the season in regards to his starts. He started near the front and immediately found his way into the lead. He continued by leading over half the race before succumbing to Ryan Villopoto. This is when the sign of things to come would be revealed. When Davi was stretching out his points lead in the beginning of the series, he would get passed by a competitor and hastily return fire by stepping up his game and regaining the position. In the weeks he was suffering from his knee injury and couldn't ride midweek, he didn't have an answer for the riders passing him or in front of him. He was essentially on damage control. When Villopoto passed him in Toronto, the team's eyes were focused on how he would react. Initially he fell a bit off the pace but remedied that in just a couple laps. He began closing the gap finishing just behind the leader in 2nd place. Clearly Davi Millsaps is back and a statement was made. The magic is returning and this Supercross Championship is far from over. The upcoming and only break of the season will benefit Davi more than any other rider and he will be eager line up at the gate and contend for the win in Houston. Blake Wharton had a lot to be fired up about after the happenings in Indianapolis a week ago. Crashing with a significant lead with half a lap remaining and then being docked 4 more positions in a controversial protest is tough to swallow. Blake needed to rebound. It was clear in practice that he aimed to do just that. 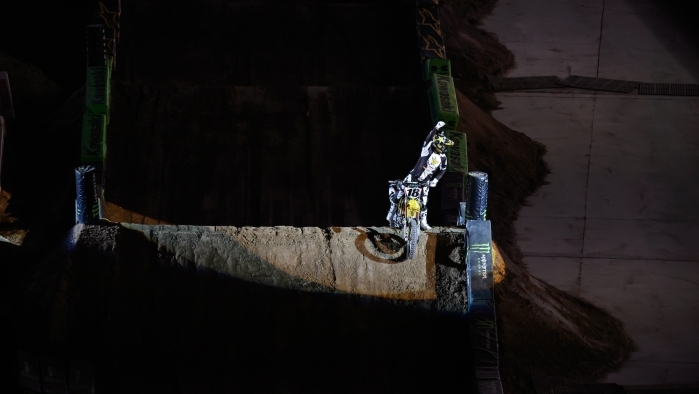 Wharton and Wil Hahn were the only two 250 riders successfully and consistently negotiating a very technical triple, triple section. It was no surprise that they were the fastest two riders in practice all day. In Blake's heat race, he opened up a commanding lead en route to another qualifying victory. In the main event he experienced a bit more adversity. Initially he was one of the fastest riders on the track and was closing in on the lead.Then at about the halfway point he was forced to go into protect mode as Hahn was on his heels. Blake began to ride a bit tight but was able to hold on for a very positive 3rd place. He wants to win and there is no question that he has what it takes. He knows what he needs to work on and Davi will be a very big asset to him over the next couple weeks. He too will be counting down the days until he can line up at the gate again and show the world what he can do. All members of the team will appreciate this well deserved break and a little extra time at home. Both Davi and Blake will not rest much however as their desire is to victorious. They will work hard to find improvements and be ready when the series returns for the second stop in the state of Texas. It is by no means out of the questions to consider the possibility of a double win, and that will be the goal. ROCKSTAR is the world’s most powerful Energy Drink. Enhanced with the potent herbal blend of Guarana, Ginseng and Milk Thistle, ROCKSTAR is formulated to provide an incredible Energy boost for those who lead active and exhausting lifestyles – from athletes to rock stars. Available in eighteen amazing flavors at convenience and grocery retail outlets in over 26 countries, Rockstar supports the rock star lifestyle across the globe.